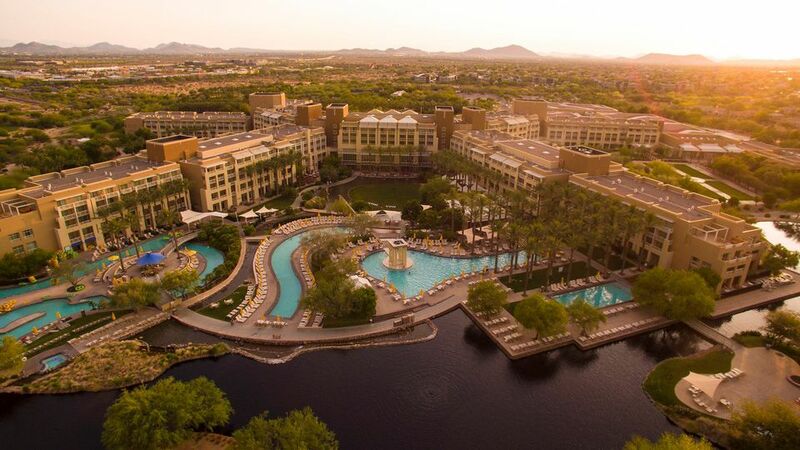 The JW Marriott Desert Ridge Resort & Spa is an award-winning resort in north Phoenix, located about 20 miles from Phoenix Sky Harbor International Airport (PHX) and about seven miles from Scottsdale Airport (SDL). Your first impression of the grand lobby, with the huge bar and lounge below and outdoor views, sets the stage for the luxury that awaits. While the resort is situated on more than 300 acres, all the guestrooms and suites -- nearly 1,000 of them! -- are located in one building with several wings and six floors, affording rooms different views including garden, pools and golf course. Significant space is allotted to conference and meeting facilities, and there are both indoor and outdoor lovely spaces for special events, weddings, and receptions. Who is most likely to stay at the resort? You'll find it attracts business people, couples and families alike! There's something for everyone here. The restaurants are a destination for locals as well as guests of the resort. Not interested in being around too many kids? Stay on the opposite side of the resort's water slide, lazy river, and Family Escape. Meritage and Roy's can be pricey, so you won't find many kids there, although, of course, they are not excluded. Book your spa and golf outings, and consider dining and cocktails in the Griffin Club. There are options here for every kind of traveler! Fun fact: Check with the Concierge about taking a tour of the Chef's Garden. Not only do they grow their own fruits, berries, and veggies, but they also harvest their own honey from resort beehives and use the honey in the resort restaurants. You won't be visiting the bees, though, so don't worry about packing your veiled helmet for this trip! Whether you are attending a conference, celebrating your wedding day, taking a family vacation or you are just a couple enjoying some romantic leisure time, the JW Marriott Desert Ridge Resort & Spa will immerse you in country club lifestyle. With seven dining opportunities at the resort -- and even more nearby at Desert Ridge Marketplace and at High Street -- you won't go hungry! Meritage at Wildfire Golf Club offers an upscale steakhouse experience. Roy's brings Roy Yamaguchi's signature Asian fusion touch to the resort. Bring your available credit limit! I have dined here several times, and the food is always good and artfully presented. At my recent visits, the lobster potstickers were a little light on filling, the calamari was tasty and the entrees -- seared scallops and a special ono dish were excellent. I can't seem to dine at Roys' without trying one of their specialty cocktails -- either a Mai Tai or a Feisty Mango or a pineapple infused martini. It's so hard to choose! For dessert, we've tried both the Pineapple Upside Down Cake and the Roy's Melting Hot Chocolate Souffle. You won't go wrong with either of them. Stonegrill is the restaurant serving breakfast, lunch, and dinner with Southwestern flair. During my resort stay, I had dinner at Stonegrill, and was impressed with both entrees that we had chosen: the Braised Beef Short Rib was tender and delicious. Mole is always a risk, but I was rewarded for my bravery with my order of Braised Chicken Mole. I would order it again! My expectations were high for the signature guacamole appetizer, prepared tableside. It was a hefty portion but unremarkable, in my opinion. (Uneaten, it remained on our table through entree, dessert and was still on the table when we left!). The dessert choices didn't strike our fancy. Stonegrill does offer a more affordable option than Meritage or Roy's with casual food choices like salads and a burger, a plus especially if the kids are in tow. Don't miss the opportunity for a quiet dining experience for breakfast or lunch poolside at the Spa Bistro, where organic menu items, fresh herbs, and vegetables from the Chef's Garden and lighter fare (but not light on flavor) are the specialties. Other dining options at the resort include Splash Bar & Grill at the pool, the lobby bar twenty6 offering small plates, and Starbuck's for quick eats, coffees/teas and baked goods. Simply stated, Revive Spa is huge. With more than 40 treatment rooms in addition to the salon, an impressive store, fitness center, steam room, sauna, a pool, and a Bistro, there are a number of relaxation areas, both indoors and outside, scattered around the 28,000 square foot facility. Any spa lover could easily spend a day (or several days) here. What? You're not a spa lover? Revive Spa might make you change your mind about that! Two championship golf courses will challenge the most discerning golfers. If you want to play golf where the professional ladies of the LPGA play the JTBC Founders Cup each spring, you have arrived. It's Wildfire Golf Club. Remember that your resort fee includes driving range balls! The lazy river with complementary inner tubes, the water slide (42" minimum height restriction) and zero-depth pop-jet fountain are a draw for families, but there are several heated pools at the resort where you can find your perfect spot or arrange for a private poolside cabana. It isn't really a secret, but you might not know about the Griffin Club. Guests 21 years of age and older can add Griffin Club access to their daily stay for a fee and take advantage of this exclusive experience that includes breakfast, lunch, happy hour hors d'oeuvres, cocktails, daily Chef presentation, and dessert sampling. Indoor and patio seating, lounge area, TVs, all-day candy bar and soft drinks. If you are staying here for business (or sans children), and want to be able to relax without having to wait for table service at a restaurant, I highly recommend the Griffin Club. Family Escape is a place where those guests with kids can take a break from the pool and play video and board games, watch movies, use the computers/tablets, create works of art, play ping pong and more. Daily activities are scheduled. Family leisure time is included with your resort fee, but drop-off (half day, ages 4 - 12), some crafts and special parties have a fee. A full-service tennis center with eight tennis courts, bicycle rentals, and property tours round out the amenities list. Fun fact: Herbs from the Chef's garden are used in Revive Spa's signature lotions and washes. The JW Marriott Desert Ridge Resort & Spa is located in North Phoenix, about 20 miles from Phoenix Sky Harbor International Airport and only about three miles from North Scottsdale. From Loop 101 - take Exit 31, Tatum Blvd. Turn north for about 1/2 mile. At Deer Valley Road turn east (right). In about 1/2 mile turn left on Marriott Drive. The resort entrance will be on your right. Fun fact: The culinary team at Stonegrill utilizes the pods from the resort's mesquite trees and grinds them into mesquite flour which is gluten-free and used in the blueberry pancakes. I'm not sure why you would ever want to leave the JW Marriott Desert Ridge Resort & Spa, but if for some reason you feel the need for additional shopping, entertainment or a movie, you won't have to go far. Desert Ridge Marketplace is a shopping and dining destination with about 75 stores and 30 restaurants. There are movies here and free outdoor concerts on Friday and Saturday nights. Desert Ridge Marketplace is about a half-mile walk from the front entrance of the resort. At High Street (previously known as CityCenter at CityNorth) you'll find food, cocktails, shopping, and entertainment. Did you pack your boots? Cowboys Saloon features live musical entertainment, line dancing and more. Rick Bronson's House of Comedy, as the name suggests, is a comedy club where you can see big-name comedians as well as attend open-mic nights. Known locally as MIM, this is a must-see attraction. You won't see everything in just one day! If you are at all interested in or enjoy music, this one-of-a-kind museum has topically and geographically arranged exhibit halls with 15,000 instruments and objects in their collection. They also have a state-of-the-art Music Theater presenting programs and performances (separately ticketed) for all tastes and styles. This is where the big boys -- PGA pros -- play golf when they come to town each winter for the Waste Management Phoenix Open. You can play TPC Scottsdale; it is a public course! The Stadium Course is the tougher one, but that's the one I recommend. More movie theaters including a Cine Capri, a large-screen/large auditorium theater. If you are seeing a 3-D movie, or enjoy the large screen experience, this is the theater for you! in North Scottsdale, WestWorld hosts a variety of large trade shows and events, including the Scottsdale Arabian Horse Show, Barrett-Jackson Collector Car Auction, and the Parada del Sol Rodeo. Taliesin West is less than 12 miles from the JW Marriott Desert Ridge Resort & Spa and is a must-visit for anyone who has an interest in architecture and/or Frank Lloyd Wright. Originally his winter home and the location for the school teaching his principles of architecture, there are several guided tours offered there. I have never been to a perfect hotel or resort. Because everyone is different and has unique travel preferences, features that appeal to me might not be important to you, and vice versa. Here are some thoughts about my stay at the JW Marriott Desert Ridge Resort & Spa in Phoenix. Request your room based on how you expect to spend most of your time: near Family Escape/water slide/lazy river or near the spa. Resort fitness center for those not using Revive Spa. Tennis facility with a full-service pro shop. Healthy menu for breakfast and lunch at Revive Spa: salads, smoothies, sandwiches and more. Reasonably priced day-use fee for Revive Spa and group exercise classes. Family Escape Center for drop-in air-conditioned activities and scheduled special crafts and adventures. The daily schedule includes property tours and a variety of special activities. Wildfire Golf Club with 36 holes of championship golf, full driving range, lessons, specials for kids. There is a resort fee. It includes self-parking, bike rental, golf balls at the driving range, use of tennis facilities and racquets, free dinner appetizers at Meritage and Stonegrill (excludes Roy's, and restrictions apply), use of fitness center. Complimentary wireless in meeting rooms, lobby, and public areas only. In-room wireless internet access has an extra daily fee, in addition to the resort fee. Note: If you don't need resort's wireless service, I would request to decline this charge upon check-in. It can't hurt to try. No honor bar in room. Gold and green room decor, as well as furniture, sofa and chairs with nailhead designs all, seemed a bit dated to me. Fun fact: Lounge twenty6 has its own private label wines, honey ale beer, and bourbon.